Haruyuki "Haru" Arita is a short, overweight boy who is constantly bullied at the Umesato Junior High School which results in him having exceptionally low self-esteem. To escape the torment of real life, he logs onto the school's Local Network where he always plays squash by himself, and his innate skills bring him the attention of Kuroyukihime, the school's popular and attractive female Student Council Vice-President. After helping him against some bullies, Kuroyukihime introduces Haruyuki to Brain Burst, a secret program that is able to accelerate the human cognitive process to the point at which time appears to stop. Haruyuki soon learns that Brain Burst is more than just a program, but an Augmented Reality Massively Multiplayer Online (ARMMO) Fighting Game where people fight each other in fierce duels in order to obtain Burst Points which can be expended for acceleration abilities in the real world. Kuroyukihime then enlists Haruyuki's help in reaching Level 10 within Brain Burst by defeating the "Six Kings of Pure Colour" and ultimately meet the creator of Brain Burst to learn its true purpose. With every challenge they face in the Accelerated World, Haru and Kuroyukihime, under their aliases "Silver Crow" and "Black Lotus", gather trusted allies, confront treacherous enemies and their bond grows stronger while working to attain their ultimate objective. 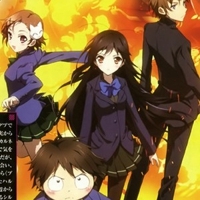 1865 users rated Accel World [TV].